Purchase online PN532 NFC RFID V3 Module in India at low cost from DNA Technology,Nashik. NFC is a popular technology in recent years. Most company has introduces their latest high-end phones. Almost all the high-end phone in the market support NFC. The ESP can also be used to read out the PN532 NFC/RFID Tag Readers, using tags that are compliant with the Mifare classic protocol. The RFID reader has to be connected to the I2C Bus. The RFID reader will send a message to your Home Automation controller containing the unique RFID Tag ID. 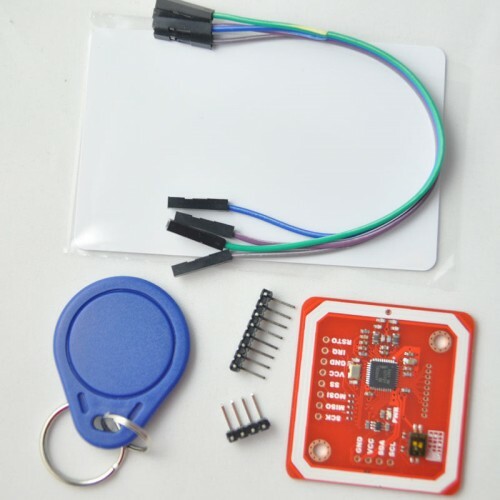 PN532 RFID/NFC Controller ShieldPN532 breakout board shield is the perfect tool for any 13.56MHz RFI..